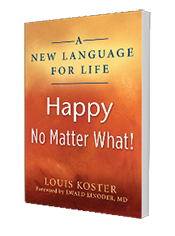 A New Language For Life is how you express yourself when you bring oneness of being to language in each and every situation of your life. Oneness of being occurs when you allow and let be. I was at a funeral yesterday and people kept trying to get a reaction out of me by comparing me to my mum. It was funny because I didn’t care. I’m not my mum so there was no reason for the comparison. What was most amusing was the fact that they were exasperated by the fact that I was unperturbed. The secret was I knew who I was and was happy with the knowledge. At one point, someone commented that the main character doing the labeling was just bothers that she couldn’t be just like me, which just made me smile, because it was the truth. So yeah, I’m grateful for your emails. They reinforce what I already know from an advanced level.??????? Thank you for the opportunity to read our book. I love your 6 suggestions fit very well right now. I agree with you but find it difficult to practise.